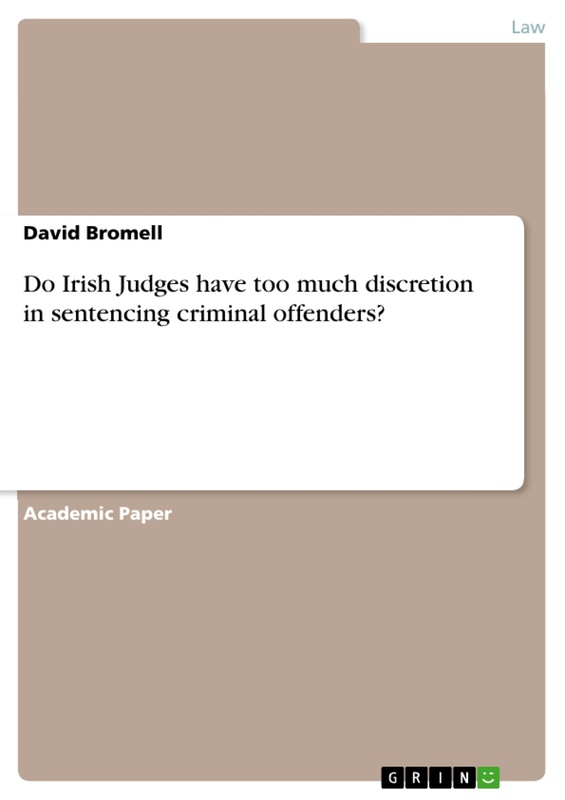 Do Irish Judges have too much discretion in sentencing criminal offenders? With no certain change evident within the Irish judicial system in relation to the ability and freedom of how a judge decides upon a sentence in a case, a logical starting point would be to assess the current practices used by judges in their decision making process. Conventionally a judge’s decision in sentencing is based upon the seriousness of the offence and the evidence presented. However to understand this we must first understand the meaning of “sentencing”, “A sentence is the judgement of a court stating the punishment to be imposed on a defendant who has pleaded guilty to a crime”. In law, a sentence forms the final explicit act of a judge-ruled process. Despite the commonly mistaken belief that the jury decides the faith of a defendant, it is the judge of the court that does this. The act of sentencing a criminal consists of a judge deciding what the criminal justice system should do with the guilty defendant. Despite the decision for sentencing being entirely left up to the judge, I do not think Irish judges have too much discretion in sentencing criminal offenders. 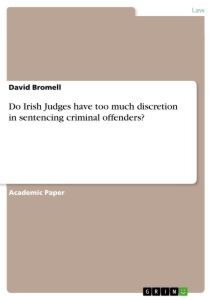 The aspirations of this essay will be to examine the discretion which Irish judges seem to have when sentencing criminal offenders, and to also examine what diversifications could be made to curtail their exercising of this discretion. To do this accurately I will make a parallel comparison with similar jurisdiction’s such as England and Wales but will also compare it to jurisdictions not so similar such as the US and Australia. Traditionally, guidance on judicial discretion was taken from the Criminal procedure Act 1967. The purpose of this act was “to establish a new procedure for the preliminary examination of indictable offences and for this and other purposes to amend criminal law and administration”. It has long been understood that the punishment must be in proportion to the gravity of the offence, such was stated by Judge Walsh “It is therefore the duty of the courts to pass what are appropriate sentences in each case having regard to particular circumstances of that case – not only in regard to the particular crime but in regard to the particular criminal”. “The principle of proportionality” is one which is naturally followed by judges when deciding upon a sentence and is based upon a principle of constitutionality. This was clearly identified by Judge Flood by stating “ The imposition of a particular sentence must strike a balance between the particular circumstances of the commission of the relevant offence and the relevant personal circumstances of the person sentenced” .It is not out of the ordinary in criminal cases for a judge to utilise his discretion to adjourn the case in order to facilitate a full hearing on the on the question of the sentence, as the mitigating factors which contribute to the victims guilt will essentially shape and form the sentence hearing. These mitigating factors should be considered by the judge only after thinking about the sentence to be imposed in relation to the gravity of the crime. Upon the completion of the analysing the mitigating factors the judge will then use his discretion to hand out the sentence. From the very beginning Irish judges have been given a wide birth in relation to the discretion of their decisions. By going upon a system which takes the circumstances of the offence, the character and the antecedents of the offender into account a judge is essentially given the freedom to decide a sentence on the basis of “inducing the offender to turn from a criminal to an honest life, and indeed the public interest would be best served if the criminal if the criminal could be induced to take the later course”. The determination of what sentence to impose on an individual is and exercise of judicial power and discretion by the judge. However despite this discretion a judge must decide a sentence based upon the law, not their personal feelings. In considering what sentence would be appropriate the judge mast take into account the gravity of the crime by focusing on the facts on the individual case. This once again means that there must be proportionality between the severity of the sentence and the gravity of the crime. Generally a key indicator of the severity of a crime is the maximum available sentence for said crime. Before a sentence is passed a plea of mitigation is heard, so as to cast the victim in the most favourable light possible. The aim of the plea of mitigation is to make an attempt to reduce the sentence being given to the victim. As a general rule the worst sentence is reserved for the worst of crimes, however this does not prohibit the court from imposing a maximum sentence on a victim. “The Criminal Justice Act 1999 provides that a court shall not be precluded from imposing a maximum sentence is satisfied the exceptional circumstance relating to the event so warrant”. Due to the fact that there are both maximum and minimum sentences which must be imposed in relation to the gravity of the crime, I do not believe that judges have too much discretion when sentencing in criminal trials, as despite the fact that they are the sole party who decides the fate of a plaintiff, they are also given guidelines to abide by. If a judge’s discretion in sentencing a victim was to be curtailed by strict rules then a fair trial could not be held, as the principle of proportionality could not exist.  “In a civilised society, legal process is the machinery for keeping order and doing justice. It can be used properly or it can be abused. It is used properly when it is invoked for the vindication of men’s rights of the enforcement of just claims. It is abused when it is diverted from its true course so as to serve extortion or oppression; or to exert pressure to achieve an improper end”. Within Ireland the courts do not categorize definitively what may amount to abuse of process, as it would only restrict a judges ability to deal with the abuses that come before him, if a definitive set of rules were to be formed a judge would not be able to utilise their own discretion or utilise the principle of proportionality. The jurisdiction of which a person is suing in essentially creates the constitutional right to litigate against another party, however the constitutional right to litigate is not always palpable. Such instances were stated By Murphy J “a balance must be struck between a person’s right of access to the courts and the right of other persons to be protected against an abuse against their rights”. If Irish judges did not have discretion upon the decisions they make their role in preventing the abuse of the judicial system would be one which would not be carried out to its maximum capacity. By litigants abusing the judicial process a fair system within the courts could not be held, however “the onus will always be firmly placed on the party alleging the abuse of process to show that another should be deprived of the constitutional right to litigate”. The conceptual ideology of the abuse of process by withholding a person’s constitutional right to litigate is one which a judge must be able to deal with on a case to case basis. If s judge could not utilise their discretion in such instances, then the court system would be highly unbeneficial as it would favour those who abuse the process and right of litigation. Jonathan Law and Elizabeth A. Martin, Oxford Dictionary of Law (7th Edn, Oxford University Press 2014) 454. Law Society of Ireland, Criminal Litigation (1st Edn, Oxford University Press) 158. Criminal Justice Act 1999, s.29. European Convention on Human Rights, Article 6. A short essay I did in my first year as a law student. How has Fianna Fail adapted to changes in Irish society since 1945? Bobby Sands - An Irish martyr?